Mad music that you might never have heard otherwise – the fantastic fifth installment in this excellent series inspired by The Cramps – and maybe the deepest-digging so far! There's no holds barred here – both in the source of the material, and the style – and the main criteria just seems to be finding tracks that are as way-out and wild as possible – almost all of which are pulled from the 45rpm underground of the late 50s and early 60s! 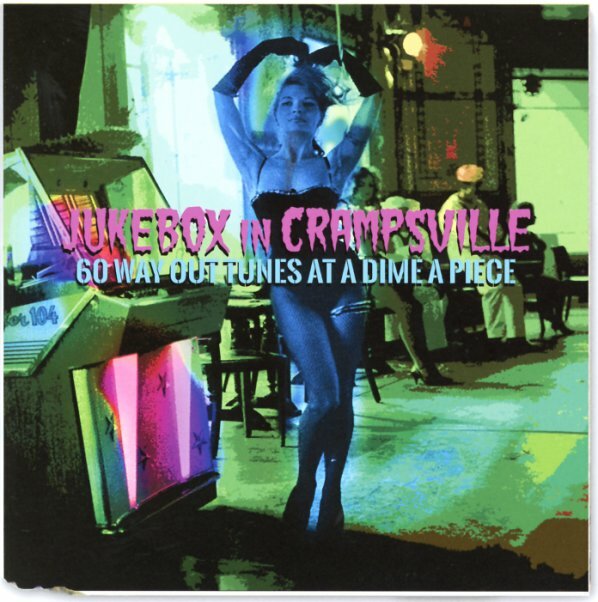 The "jukebox" in the title is well-placed – as most of these cuts are mad rompers that would really liven up a nightclub – but we also can't imagine there ever being any jukebox as hip as this one, to bring all these fantastic singles together. Titles include "Icky Poo" by The Nomads, "Pimples & Braces" by Ric Gary, "Fling" by The Phaetons, "Laffin Beatnik" by Johnny Beeman, "Bop Crazy Baby" by Vern Pullens, "Boom Stix" by Curley & The Jades, "Cannibal Stew" by Jerry & Mel, "Talk About A Party" by Lee Braun, "Mad Gass" by The Royal Teens, "Mama's Place" by Bing Day, "Mo Taters" by The Earthworms, "I'm The Wolfman" by Round Robin, "A Logger's Wife" by Buzz Martin, and "Strollie Bun" by The Blonde Bomber. © 1996-2019, Dusty Groove, Inc.